A couple weeks ago I grew tired of protecting baby mango trees from frost and of watching more leaves on my banana plants brown due to cold nights. This has been a persistently chilly and rainy winter for us in Southern California. At my house, only once did we go a full week between rains in February, and the rainfall total for the month was 10.8 inches. That’s more than we got all last winter. The average temperature for February was about five degrees below normal in most of Southern California. It turns the mind to warmer places. And it might make you envy those who do their gardening in the tropics. I flew south and spent the first week of March in Oaxaca, Mexico. My friends and I would wake in the dark, before sunrise, drink coffee and discern the day’s waves in the predawn light from our balcony. 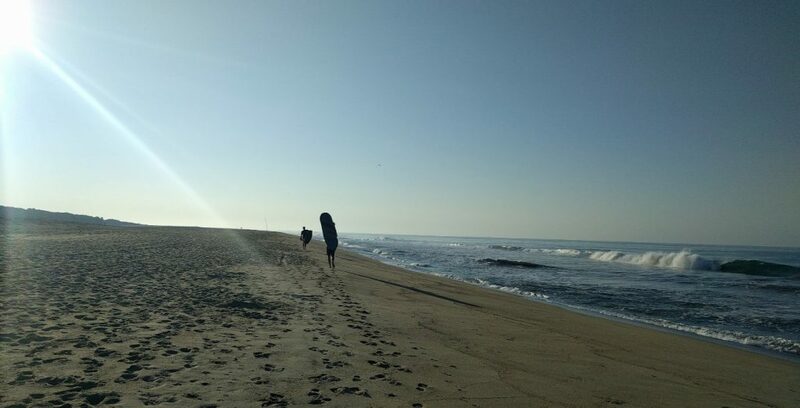 This was not a gardening trip but a surfing trip rather. Nevertheless, the climate and plants around me captured my mind as much as any wave. 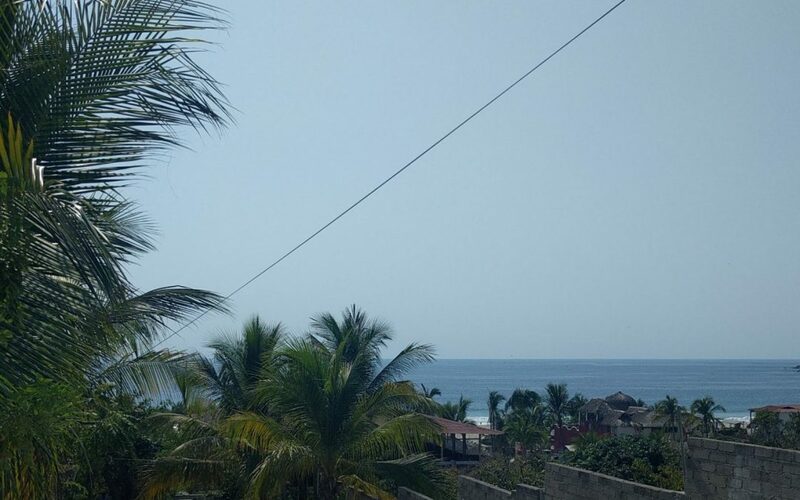 Many mornings, we surfed at the mouth of the Colotepec River, after which we walked to Betty’s place, a homestead that also acted as a restaurant. As Betty began cooking whatever we ordered — fish or huevos rancheros or sopes — I wandered her property. 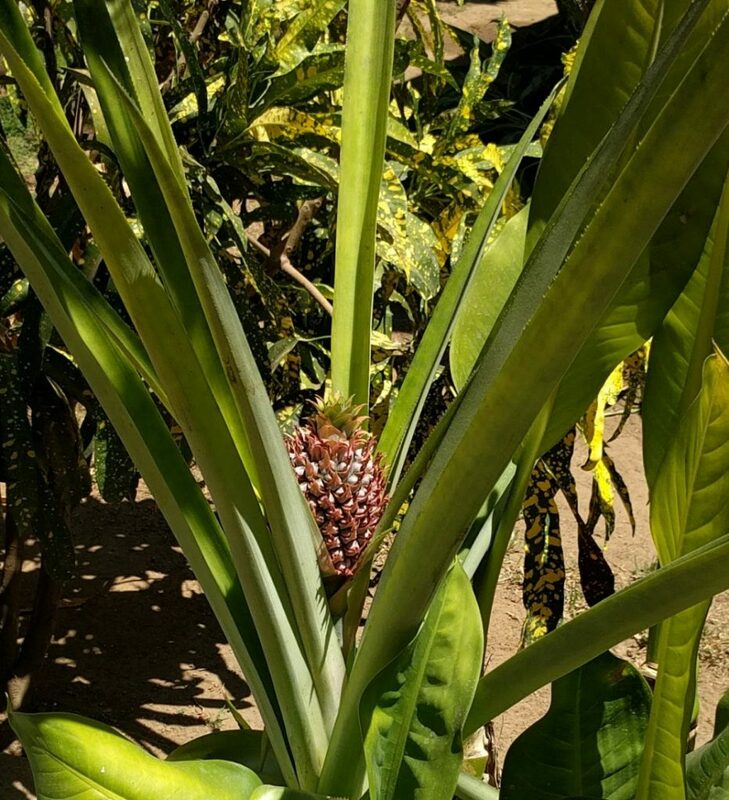 There were cattle and chickens and beautiful fruit trees: 50-foot tall mangos, coconut palms, bananas, papayas, sapodillas, pineapple, citrus, and others I didn’t recognize. 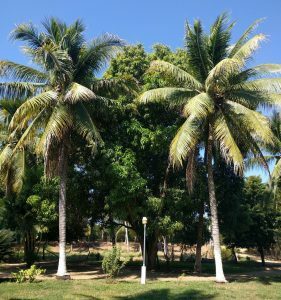 Coconut palms in front of a mango tree. Papayas at the end of rows of bananas. 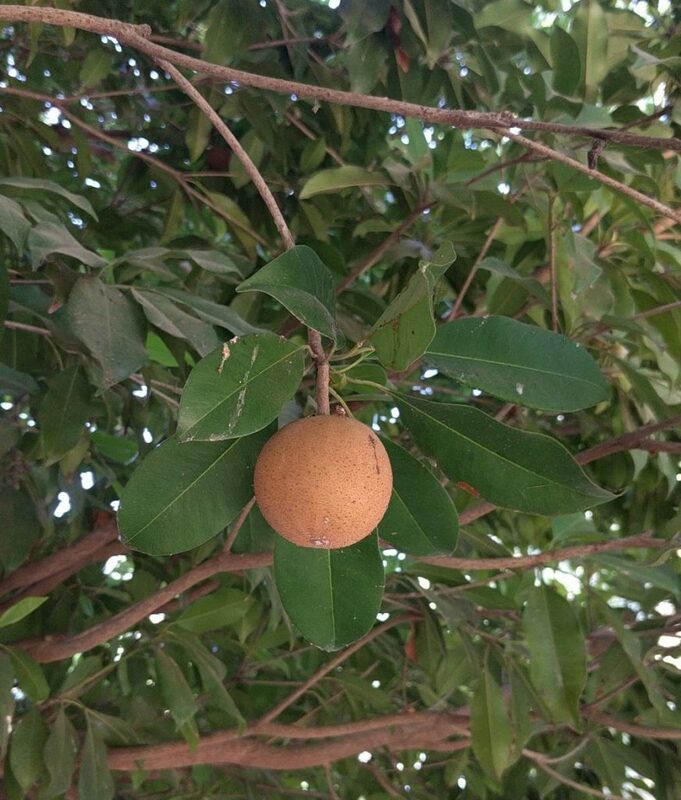 Sapodilla fruit: tastes like brown sugar. If I lived and gardened here, I thought, this is the kind of Eden I would create. 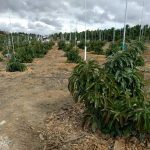 Later in the week, I began to notice the prices paid for being able to grow mango trees the size of apartment buildings and bananas as easily as weeds. We visited the market in Puerto Escondido, a roofed conglomeration of stalls where people displayed everything from sides of beef to jewelry to shoes to flowers to fruit. I was eager to sample locally grown items. 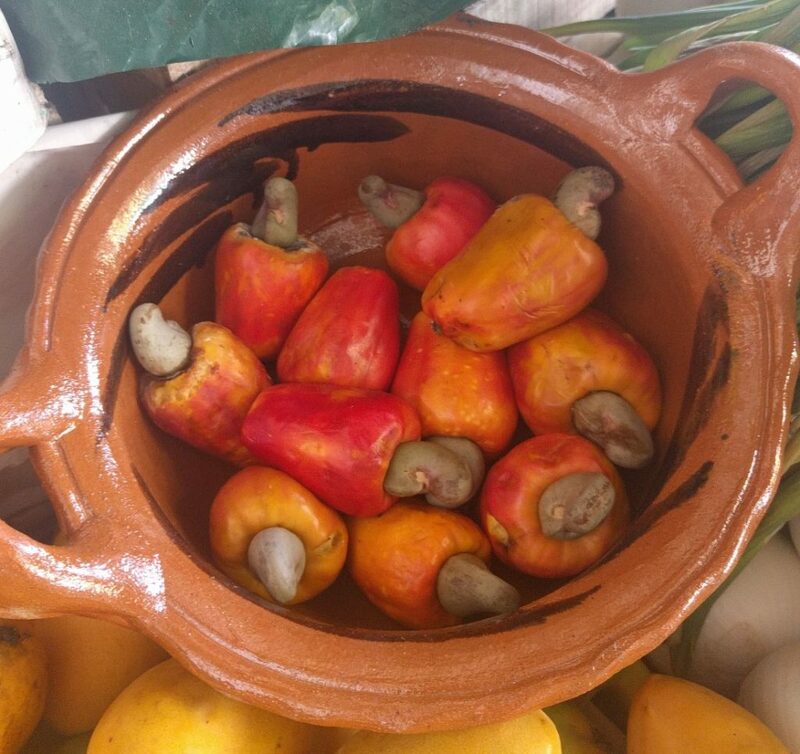 We bought some finger-sized bananas, we bought a couple different types of mangos, we bought a sapodilla, and we bought cashews the way they come off the tree: with the reddish fruit and nut husk together. But after browsing the offerings of a dozen fruit and vegetable stalls, I became aware of the local growers’ limitations. The oranges on offer were all ugly. Without cold nights, the peels never turn a uniform and brilliant orange like they do in California. They also never build a full flavor like oranges do back home. 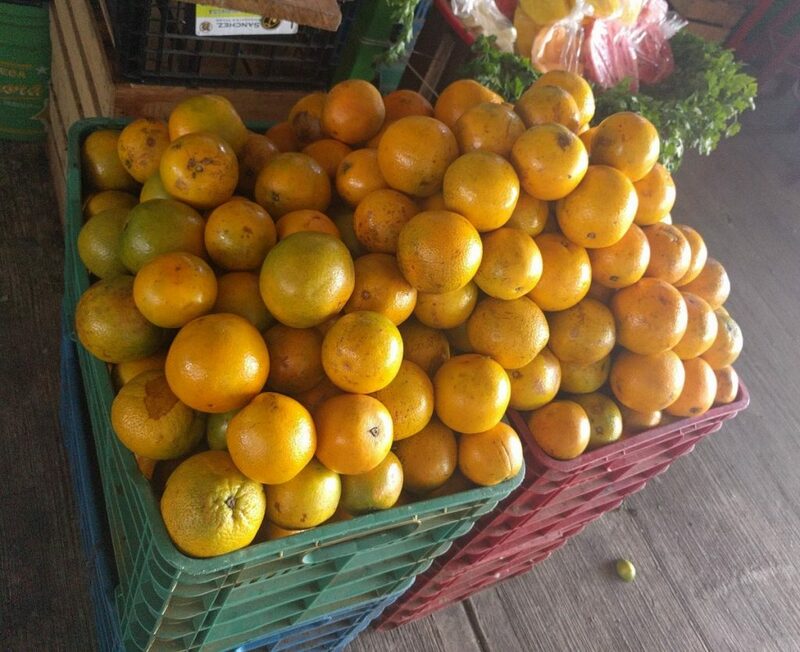 These were the best looking oranges I saw. There were apples in a couple stalls, but in such a warm climate they only grow a couple varieties. 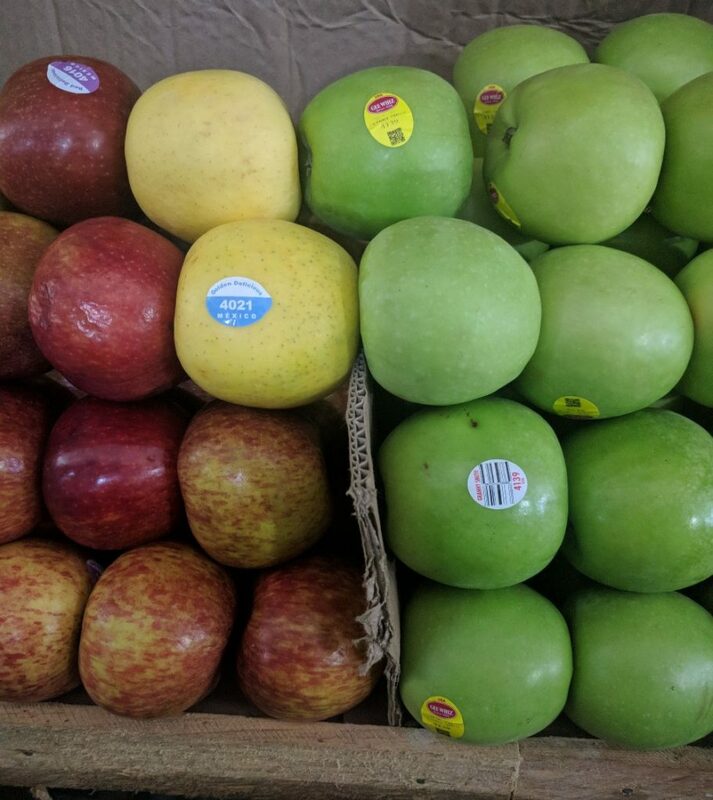 Here I saw Golden Delicious and Red Delicious apples grown somewhere in Mexico. Beside them were Granny Smith apples imported from up in Washington. I compared this to what we can grow at home in Southern California. No cashews, no sapodillas. Bananas and mangos? Yeah, but not as well, and definitely not as easily. Mango trees grew in abandoned lots, uncared for yet still laden with fruit. Then again, oranges are easy to grow back home, and they taste better. Apples too. Peaches and plums. Blueberries, grapes. We can also grow some things they can’t near the beach in Oaxaca, or at least they can’t as easily or as well. So maybe the grass isn’t greener here. Would you like to garden in the tropics? When we woke for coffee in the early morning and the temperature was 75, that was the coolest hour — not just of the day, but of the entire year. This is how low the thermometer drops just before sunrise in winter. This is the coolest hour of the whole year: 75 degrees. That’s a perfect temperature for sipping a coffee wearing shorts, a t-shirt, and sandals. But what about the rest of the day? After we’d surfed, we would walk back up the beach around 9 or 10 AM and arrive at Betty’s place with our shirts half-soaked in sweat. At Betty’s place, I noticed that already at this time of day little work was being done, and what was being done occurred in the shade. 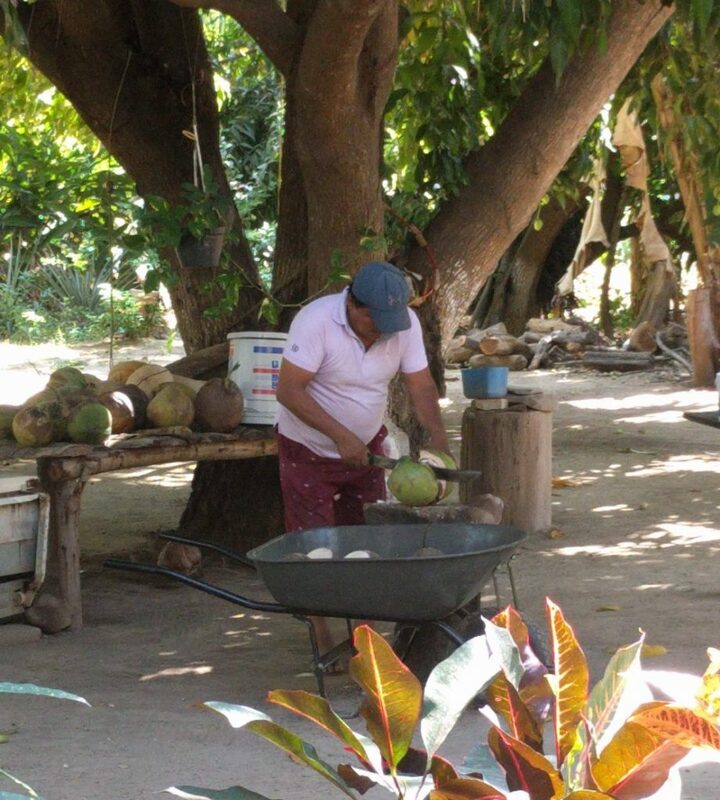 Opening coconuts in the shade of a mango tree. The sun was already intense, and the temperature reached the upper 80s by noon, here in the winter, every day. When would I work in the garden? 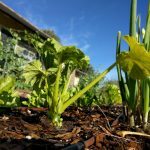 When would I sow seeds and pull weeds, water and harvest and prune? It would only be enjoyable during the early mornings and evenings, and this during winter. Summer would be more restricted with hotter days and even higher humidity. This would be a most sweatful gardening life. 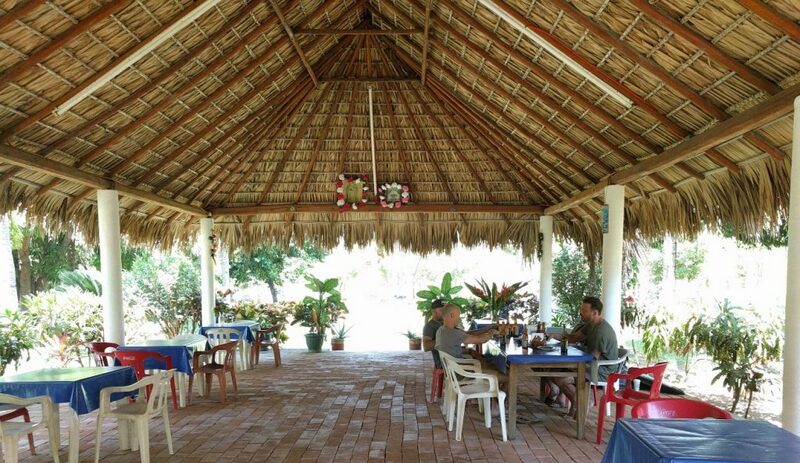 We sat under the palapa shade in the tropics being served food and drinks, and it was so pleasant. It was also pleasing to realize that I had it pretty good as a gardener back home in Southern California. No doubt, my mangos and bananas would never grow as well or as easily as here in Oaxaca, but I could grow things that couldn’t be grown or grown as well or as easily here: apricots, Hass avocados, cauliflower. I had come down thinking I was jealous of the winter warmth in the tropics, but once there I realized that while it was wonderful to spend leisure time in such a climate, there was a lot to appreciate about doing my gardening back home, where the winter nights are relatively chilly but where it is comfortable to be working in the yard for most hours of the day during most days of the year. Would I rather garden in the tropics? I think I’d rather vacation in the tropics. As they say, “The grass is always greener!”. Th cooler winter this year 2018-2019 enabled lots of baby Apriums on my tree this year, but last year there were only 4. I’m in 92120, so most stone fruit probably does better where you live due to your cooler winter, but I gave several Cherimoya trees to a friend who lived near Alpine and they all froze a few years ago. 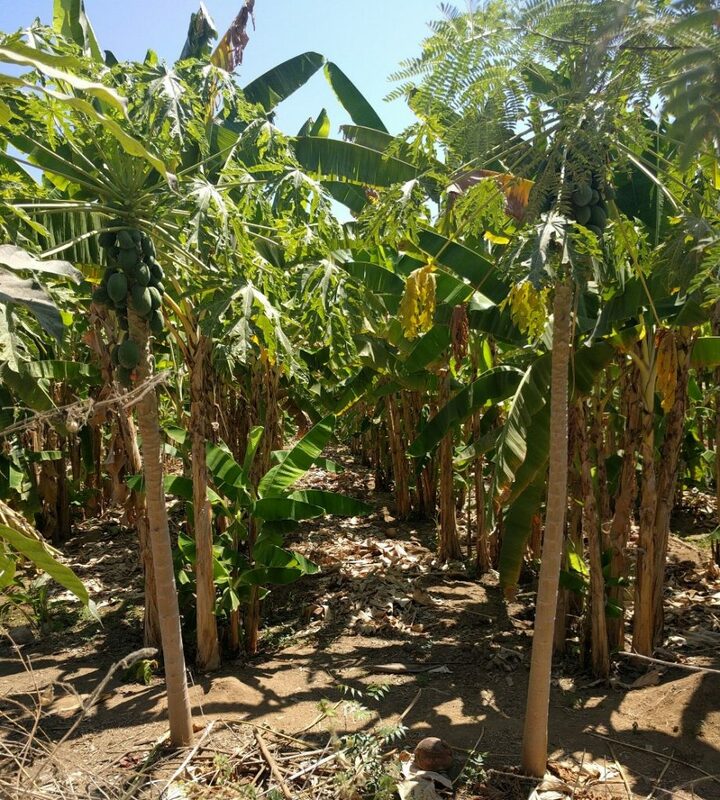 About 8 years ago I went to a guys house in Lemon Grove to get a Cherimoya tree that he grafted and he had all kinds of banana trees on his property. 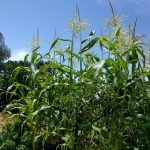 My point is you can grow almost anything in San Diego county – you just have to pick the right micro climate for what you love most. In the 70’s I remember frost on the ground in Santee, but here in Del Cerro the coldest on my thermometer since 1998 has been 37F. I had considered moving to Belize about 10 years ago, but the other thing you have to consider in third world countries is the crime – you couldn’t leave your home because the natives would strip it bare! We have a similar climate to southern California here in southern Spain, which is why I like to read your posts. This winter has been exceptionally warm and dry, daytime up to 27 and a then cold at night down to 4 and we have even had frosts here near the coast. The plant are struggling with the temperature swings. We moved here from the Scottish Highlands where I had to grow most things in a polytunnel and a greenhouse, this is a big learning curve! 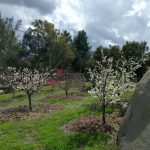 It’s wonderful to grow oranges, pomegranates, grapefruit and have now planted almonds and nectarines. My vegetable garden is coming along too. In my case the grass is definitely greener! Fascinating to hear all of this. Thank you for writing. I hope we both have gentle springs this year. This was fun to read! I agree with your conclusion! 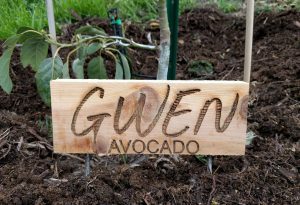 With the most basic of gardening skills one can grow more varieties in San Diego than anywhere else in the world, IMHO. I live in zone 10A literally bordering on 10B and when you combine that with some semi-successful zone pushing the varieties are endless. Where else can you grow a coffee plant next to a semi high chill stone fruit tree? The much lesser known plant heat zone map also points to San Diego as being very favorable to growing almost anything you want to. When I check out great zone 10 places and cross reference with blue/green (not super hot for super long) locations on the heat index only Southern California makes it work. Every now and then my wife and I toy with the idea of moving and the nice weather here always talks us off the cliff. Shhhhhhhhh! I’m tempted to not publish your comment. The traffic’s already bad enough. Good question, Zen. The hardest thing about growing mangos for me has been dealing with their flowering. A young, grafted mango constantly flowers instead of growing leaves and branches, which is frustrating because the little tree can’t carry the fruit that it is trying to set. So it just takes a frustratingly long time to get big enough to be able to hold much fruit. Otherwise, I haven’t found anything peculiar about growing mangos. That being said, I don’t have a lot of mango growing experience to draw from. my mango video has an link to an extensive forum I found on growing Mangos in Socal. They talked about the very same issue. I’d rather you read for yourself but it had something to do with letting the baby mangos grow to a certain size before you remove them and the flowers which tricks the mangos into thinking it’s got a set of fruit and won’t keep reflowering. Just click the name for my page… speaking of WordPress. I got email from you about this response which never happened for any of the others. It was in my spam but I fixed that. So if you were trying to fix your response notification… it works now. Cheers. This summer I’m also going to try out some seedling mangos in order to get a rootstock established for a couple years before I graft onto it. Good to hear the email notification worked. I think there’s no way I can prevent it from first ending up in spam, but I’m hoping it will make our comments and replies easier to follow. The thread mentioned that Florida rootstocks do poorly here, there’s a variety that is favored as far as disease resistance and how well it grows in CA and then people top work and graft what they want onto it. Also mentioned that seed grown mangos thrive better. Don’t worry about the spam, that’s on our end to catch it and fix it. Good thing is that the notifications are working now. Got this one too.